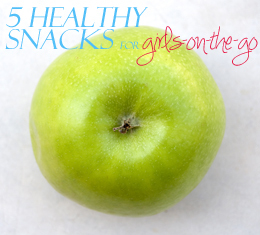 5 Healthy Snacks for Girls-on-the-Go! As a commuter student, I find it difficult at times to eat healthy. Some days, I leave campus at 6 p.m. or later, and by the time I arrive home, I’m exhausted! What we choose to eat plays an important factor in our daily performance, as well as our future, especially while we’re at school. In college, most of us suffer from sleep deprivation and poor eating habits from our busy schedules— but we should never forget our health. Below are five healthy snacks to consider packing for class! Apples are a great source of vitamins A, C, and potassium. If you’d like to add variety to your snack, consider dipping them in peanut butter or sprinkling cinnamon powder for an enhanced taste. Peanut butter contains a great source of proteins and antioxidants while jelly is rich in several B vitamins and fiber. Trail Mix and nuts help suppress your appetite, which can definitely help on the days you have extra-long classes. They contain protein, fiber and omega-3 fatty acids. Trail Mix offer a variety of nuts that are good for your body as well. Celery has been linked to anti-inflammatory properties and is rich in vitamin C, promoting an healthy immune system. Dipping celery in peanut butter can add an even richer taste and a boost of protein. There are a variety of flavors and kinds of yogurt available for chicsters. Most contain potassium and vitamins B-12 and B-2.